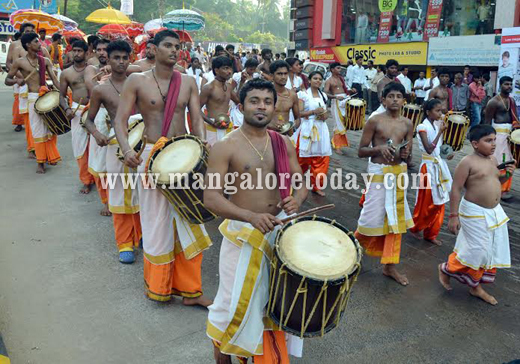 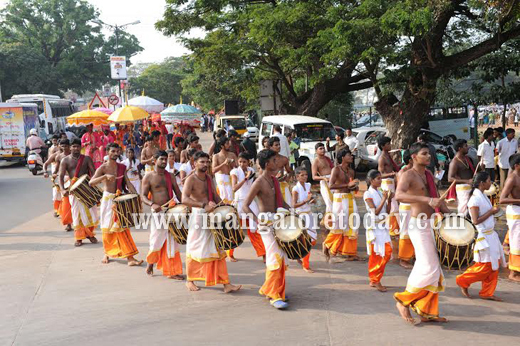 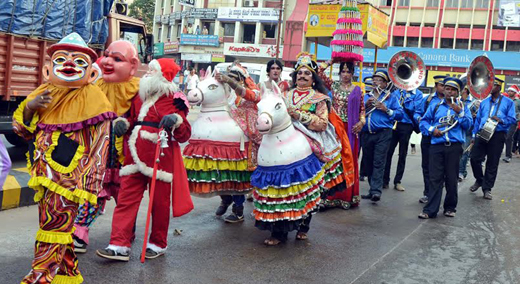 Mangaluru, Dec 24, 2014: The annual 10-day Karavali Utsav organised by the District Administration got off to a splendid start in the city on December 23, Tuesday. 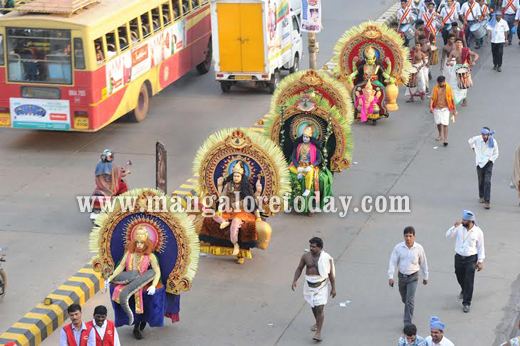 An attractive cultural procession depicting the rich culture, tradition and folk splendour of the region heralded the beginning of the much awaited Utsav. 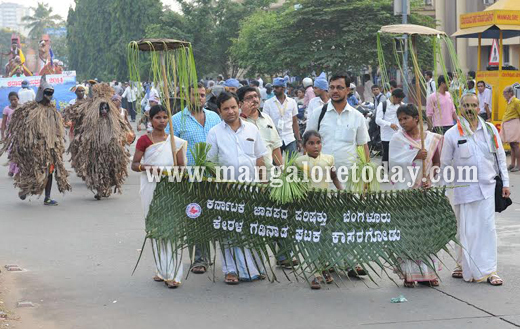 Over 5000 artistes were part of the procession which was inaugurated at Nehru Maidan by eminent theatre personality and film director Sadananda Suvarna by unfurling the arecanut flower(pingara) and breaking a coconut as per tradition of the land. 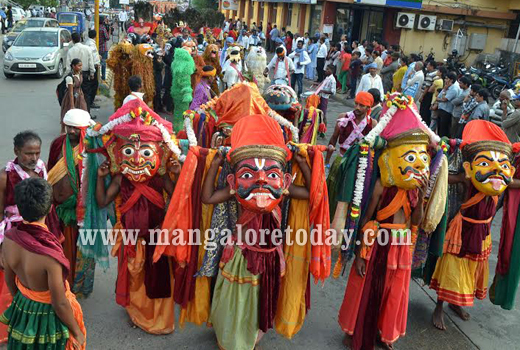 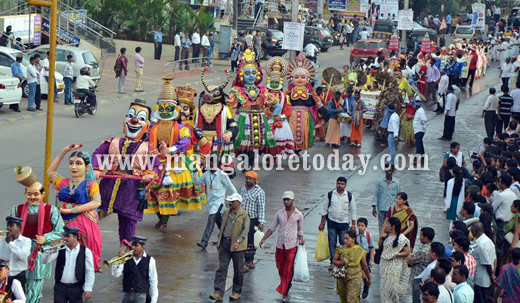 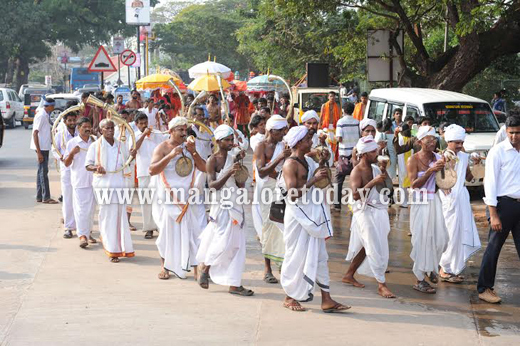 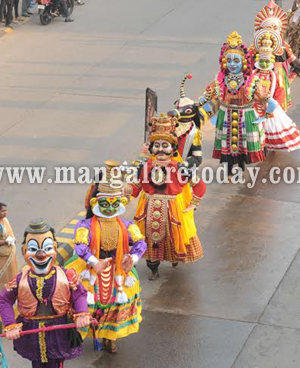 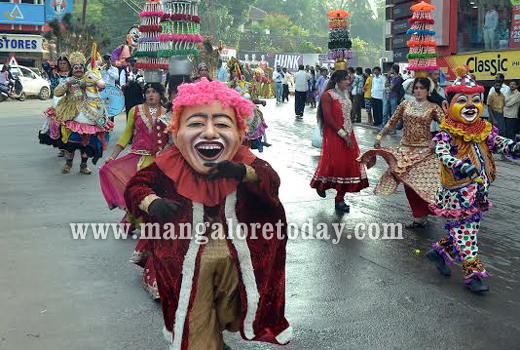 The procession concluded at the Karavali Utsav Exhibition grounds at Lalbagh. 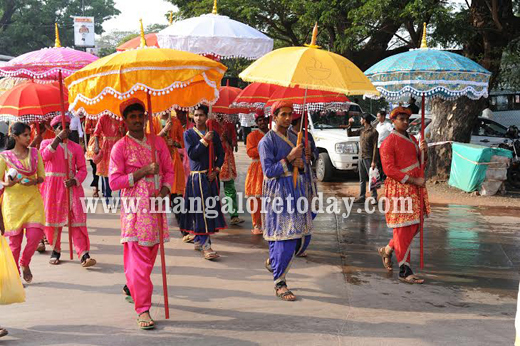 The traditional tiger dance, Duff dance, Chende teams and colourful umbrellas added to the glory of the event. 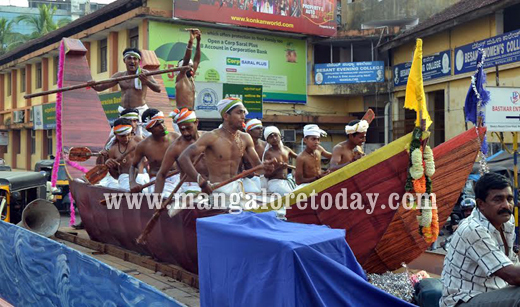 Tableaux depicting boat race, UIlal’s valiant queen Abbakka, Tipu Sultan etc as well as a Health Department vehicle creating awareness on Malaria were part of the procession. 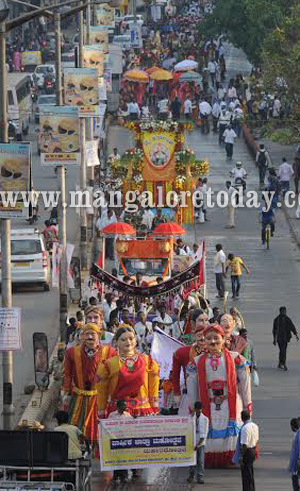 Several students also participated in the procession. 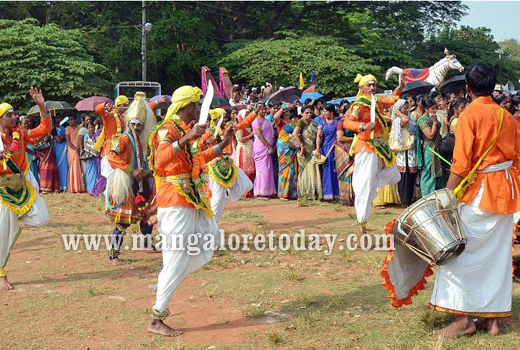 Formal inauguration: The Karavali Utsav was later formally inaugurated by Nitte University Vice Chancellor N Vinay Hegde. 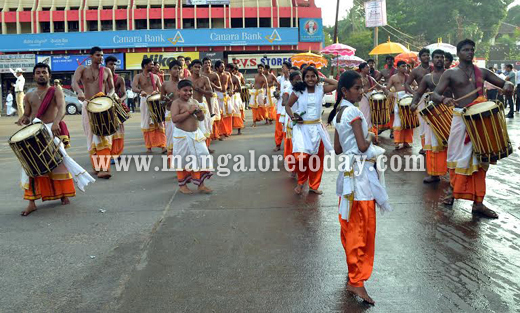 In his address, he said a healthy society can be built by strengthening our culture and sensitizing the society on cultural values. 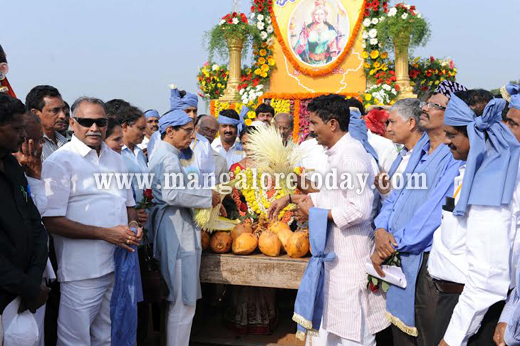 Hegde further stated that events like Karavali Utsav go a long way in enlightening the present generation on the rich heritage of the land and passing it on to future generations. 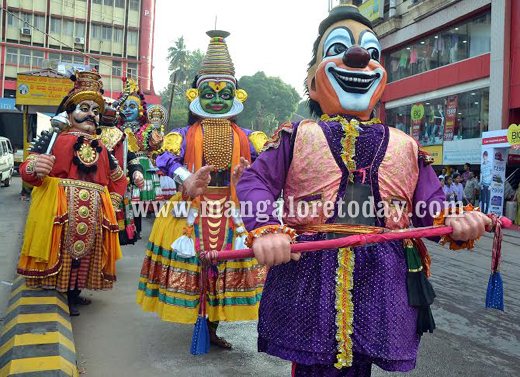 DK District in-charge Minister B Ramanatha Rai inaugurated the Karavali Utsav exhibition and informed that the state government had sanctioned Rs 50 lakhs to the event. 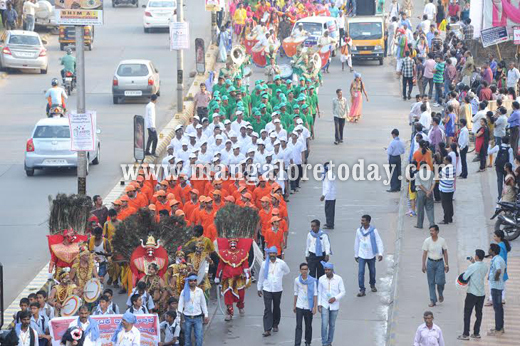 He also requested the public to be a part of the event and contribute to its success. 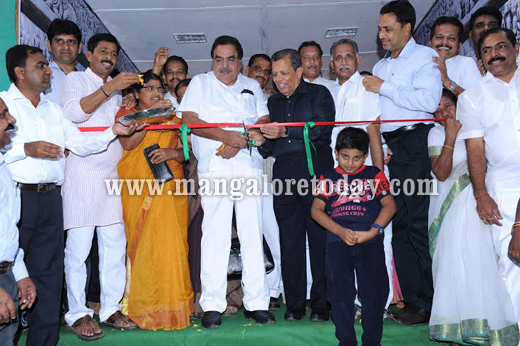 JR Lobo, MLA of Mangaluru South presided over the function. 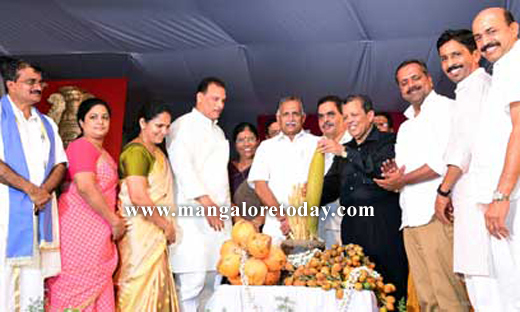 State Ministers UT Khader, K Abhayachandra Jain, Deputy Commissioner A.B. 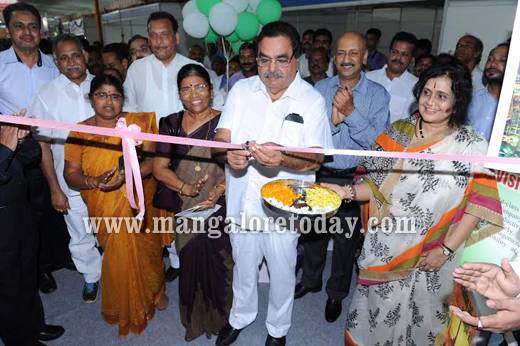 Ibrahim, MLA BA Moidin Bava, MLC Ivan D’Souza, Mayor Mahabala Maarla, Deputy Mayor Kavitha, ZP President Asha Timmappa Gowda, ZP CEO Tulasi Maddineni and others were present.